Guild Wars is basically a war between guilds, it's set up as a tournament with 8 "host" guilds that can participate, all 8 "host" guilds can have 3 allies each. Guild War or GW for short happens on Saturday and Sunday. The earlier round at 15:00 - 16:00 and the later round at 20:00 - 21:00 (set in Eastern Daylight Time (EDT) -0400 UTC.) Clicky to check game-time. Max amount players from each side is 75. Having allies does not increase the limit. How do I sign my guild up for Guild War? There's no level required to sign your guild up for GW! To register you need to go to the NPC named "Receptionist" in Kaslow (x=31, y=293.) You can register and withdraw your guild from GW up until one day before the competition ladder is announced (it's announced after each maintance.) Only the guild leader can withdraw or register for GW. If there's more than 8 guilds that signed up for GW, the top 8 with the most reputation will get the spots. If there's less than 8 guilds that registered for GW, they auto-select the top 8 guilds with the most fame that week to fill the remaining spots. How do I check GW schedule? 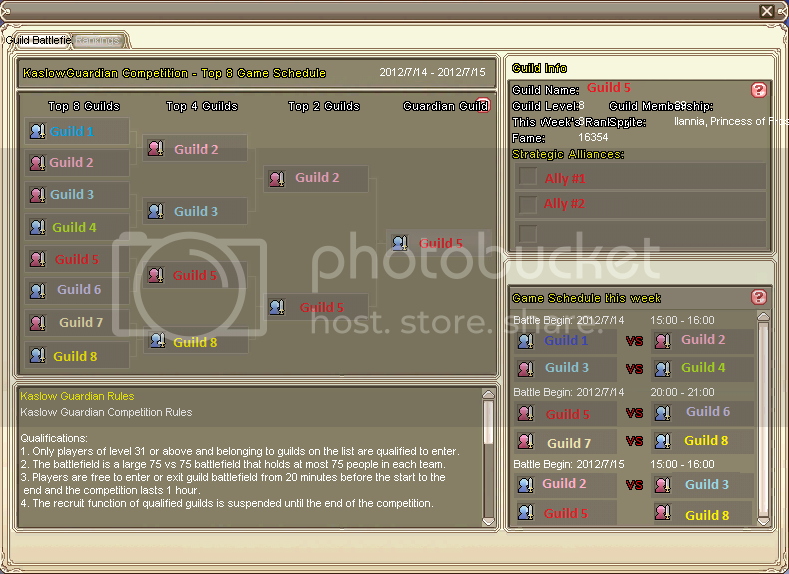 The guild that won GW the previous week always have the first spot on the GW schedule, so in this case the guild named "Guild 1" in blue won last week. If you click a guild, their guild info shows on the right, like the picture shows with "Guild 5." You can see their level, amount of members, amount of prestige, their rank, the amount of fame they gained the week they registered, their sprite king and most importantly their allies. As mentioned earlier, each host guild can have 3 allies each. I successfully signed up for Guild War! What's the objective and how do I achieve it? If you keep all the 5 crystals your color for 5 minutes without any interruption, the GW ends. Congrats, you now won! If your team reach 5000 points before the timer runs out, the GW ends and once again, congrats you won! - Getting the most points when timer ends! GW lasts for 60 minutes, but if none of the teams managed to end the GW by the time the timer ends with one of the methods above, each crystal will then add up to a 1000 points reward once the timer stopped. If your team has the most points once all the crystals has been added up to your already gained points, congrats you won! What's the benefit of participating in GW? 'm inside the Guild War Arena, where do I go? 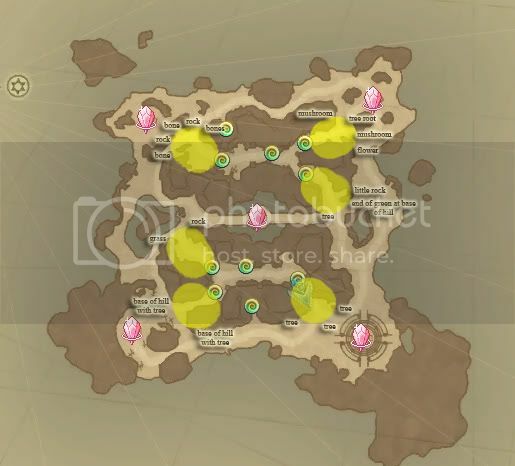 This is how the Guild War map looks. Press (M) to open your map. 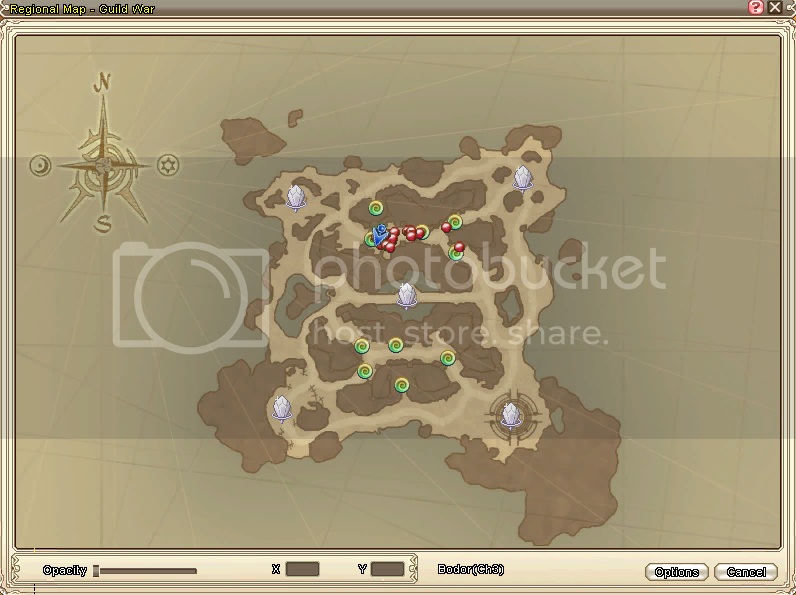 The red dots on the map are everyone on your team, both guildies and allies are shown in same color. When you turn it in, you get x amount of "Crystal Guardian" fame, it increases with your level. There's also two portals, one in north and one in south, they're linked to each other and they let you exit combat when you go through them. 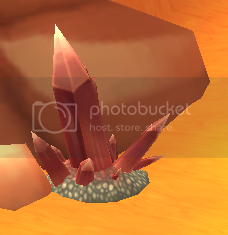 I have found my way to crystals, how do I help my team gain points? Each player on the opposite team you kill gives your team 1 point. Each crystal rewards you with x points every y second(s). If you hold the crystal your color the x amount of points will increase over time. Amounts of crystals does not effect this x amount, every crystal have it's own score count. Each Quartz you break gives your team 5 points. How do I gain as much "Crystal Guardian" fame as possible? If the war ends before 30 minutes has passed, you will gain a bonus. The bonus is set at your level x 10. The math for how points are rewarded is unknown for players, so I will skip that to avoid any misinformation. Is there anything I shouldn't do in Guild War? Healing exploiting (by creating self-made situations where you can heal yourself or a teammate for more points) and trading kills with someone on the opposite team are both considered an exploit and are bannable offenses. Hitting, tanking, breaking or disabling bits are a bannable offense. This is considered an exploit. As long as you are not in the yellow zones or hitting the bits this is not considered a bannable offense. Where can I spend my "Crystal Guardian" points and on what? Keeper of the Box can only be accessed by the Guardian Guild, the guild that wins the final round of GW. 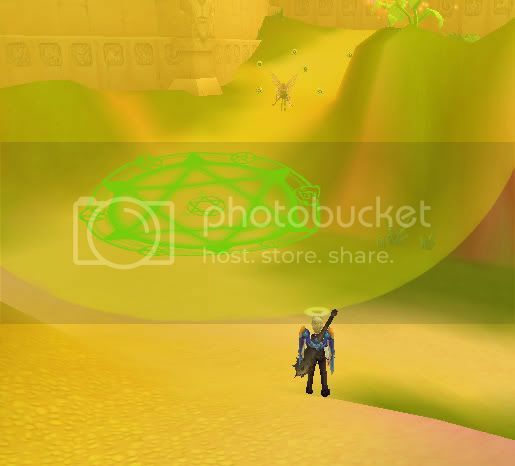 Even if the Guardian Guild had allies, the allies can not access this box after winning. Effect: 8% chance to activate weapon ability when attacking; Inflic the enemy with Seal Spell, unable to use any physical or magic skills for 3 sec. Effect: When physically attacking 10% chance of additional damage nature by 592 DMG and nature spell damage, 12% chance to activate weapon ability when attacked; Evade +70% for 6 sec. Effect: 10% chance to activate ability when attacking; Stun the enemy, unable to act for 3 sec. Effect: 10% chance to activate weapon ability when attacking; STR +250 for 20 sec. Effect: Movement speed +10%, 12% chance to activate weapon ability when attacking; Inflict the enemy with Immobilize, unable to move for 2 sec. Effect: 15% chance to activate weapon ability when attacking; Firearm damage +100% for 6 sec. Effect: Immune to Sleep Effects, 15% chance to activate weapon ability when attacking; INT +250 for 15 sec. Effect: 20% chance to activate weapon ability when attacked; Randomly removes a negative status. AT's can be found in the box furthest to the right named "Mysterious Box."